Having vacillated for some time before settling upon an underfloor engined saloon chassis, even buying some full fronted Dennis Lancet III coaches in 1953, Aldershot & District finally chose the AEC Reliance as its standard single decker, and stayed with this model for its coach requirements right up to its subjugation to Thames Valley (mis)management from January 1972 under the new guise of Alder Valley. Seen here in The Grove alongside Aldershot Bus Station is No.596, VCG 596H, the first of four 6U3ZR Reliances supplied in 1970 with Duple C49F coachwork sporting the (to my eye) hideous Detroit “inspired” front grille that spoilt many of the later Duple designs. Aldershot & District bought two more Reliances of the 6U3ZR specification in 1971, but these had the aesthetically more pleasing Plaxton C49F coachwork. VCG 596 passed to Alder Valley from 1 January 1972 as No. 49. I have to say that I like this coach! Functional, neat without meaningless frippery: where is the Detroit? Burlingham, Whitson, Yeates, other Duple perhaps…this is more Turin! Joe – the "Detroit"-inspired part is the full-width chromed grille, which does look rather "overpowering" to my eyes. The chromed strip that runs the length of the body and at across the front at headlight level is also an excessive amount of polished metal. I see from other photos that Southdown had the sense to specify their RUF-H batch of Leopards with the same body without the chromed strip on the sides, but they were stuck with the grille. The polished metal soon went out of fashion, but the advent of the Dominant with curved side windows made the Commander look very old-fashioned in just a couple of years. The 36ft long AEC Reliance with the AH691 engine & the later AH760 power unit was a real drivers coach & the best premium weight coach on the market until the Volvo B58 surpassed it. With a Reliance the only thing to watch is they tended to run a bit hot on sustained motorway journeys. My boss instructed his drivers to keep an eye on the temperature gauge & if it starts to climb, drop a gear & keep it down to 55 to 60 MPH while it drops. Good advice, never had overheating on later Reliances. Leyland Leopard, very good, but I think the chassis was more suited to a service bus body rather than a premium coach. As a coach, the gear ratios were all wrong on a semi auto Leopard, but in terms of reliability & strength of the chassis they were unsurpassed. Not sure about the overheating: if you had a Sunbeam Imp with the usual gasket problem, going faster improved the air cooling effect! I think the overheating problems associated with the Reliance were mainly confined to the wet lined AH470 engine, later replaced by the more successful, dry lined AH505. The least said about the Hillman Imp, especially the very early examples, probably the better. MOR 581 is an AEC Reliance MU3RV. The chassis of this Aldershot & District vehicle dates from 1954, but the body we see ("MCW" in the PSVC listings) was fitted in 1967. The seating is of the B40F layout, and we see it in the Alton Rally on 18 July 2010. One unfortunate feature of the Alton Rally and Fleetwood Tram Sunday is that they often clash and, even with what some of my former colleagues used to call an ‘optimistic’ style of driving, even I can’t manage both in the day! Beautiful! I used to travel on these, and their cousins with the older style of bodywork with an opening window for the driver. One A&D feature on OPO buses was to have just a single seat on the front nearside to allow more room for passengers paying the driver, but at the time I was a regular traveller, these buses were crew-operated. My memories are of the No.19 which turned up on time every weekday morning to take me to Haslemere Station and then onto a train to Waterloo. The railway part of my journey was much less reliable until the elderly pre-war 4-CORs were replaced by 4-CIGs. Does anyone know if others of the batch were given new bodies, or why this one was treated? Crash damage springs to mind . . . I seem to recall that there were quite a number of them and one bus magazine, it may have been ‘Passenger Transport’ commented that it was surprising that such a dated style was being adopted. I take their point, but I actually liked this style. Thank you for that, David. 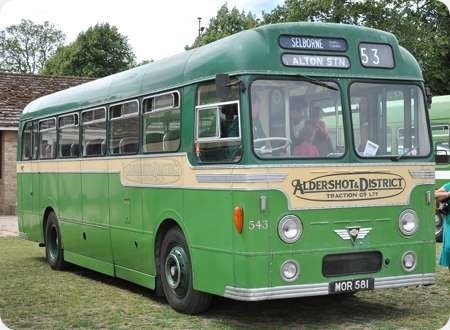 In its search for a suitable vehicle of the then new underfloor engined format, Aldershot & District initially bought a Dennis Dominant in 1951. Only three Dominant chassis were ever made, of which two were bodied, the third chassis being dis-assembled after exhibition at the 1950 Earls Court Show. Although Dennis abandoned plans for volume production of the model, there was very little wrong with the Dominant apart from its excessive weight (a characteristic shared by the the contemporary Regal IV and Royal Tiger), and Aldershot & District kept HOU 900 in front line service for fourteen years. In 1953 the company bought a solitary example of the Guy Arab LUF, which it retained in service until 1965, but purchased no more. Then, after sampling a number of different underfloor types, Aldershot & District finally took the plunge in 1954 with the AEC Reliance, twenty five being delivered with rather gawky, high floor and waistline, Strachans Everest C41C bodywork. 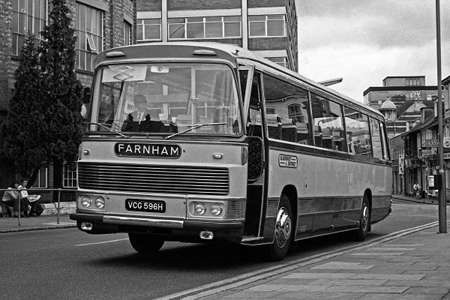 These were registered MOR 581 to 605, numbered 250 to 274, and were used on the Farnham – London express route, and on excursions and private hire until displaced by the 1963 Park Royal bodied Reliances. These Strachans MU3RV coaches were powered by the small AH 410 engine of 6.754 litres, a direct (though updated) descendant of the A172 “bootlace” wet liner engine of the 1935 Regal II. The "bootlace" engine design became the basis for all the AEC wet liner engines from the 1950s, and therein lay the root of subsequent trouble, for the original “bootlace” became notorious for cylinder liner seal and gasket failures. No. 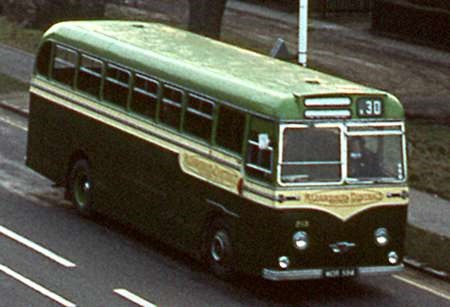 263, MOR 594 is shown in 1968 on route 3D (Aldershot – Cove, Minley Estate) passing the RAE in Farnborough Road. The inadequate destination blind display seen here was most unusual on A&D in those days, and indicates a degree of crew laziness in the early NBC era that would not have been tolerated in BET times. These machines were quite pleasant to drive, though given to a somewhat wallowy standard of ride, but the performance with the small AH410 engine was less than sparkling. In 1965, fifteen of these coaches were selected for rebodying with the then A&D standard Weymann saloon design, but the Weymann factory was closing down, and the order was undertaken by Metro-Cammell. The engineering standards on Aldershot & District were extremely high, and no doubt all of the initial 25 Reliances could have been so rebodied if required. Indeed, the remaining Strachans vehicles, of which No. 263 shown was one, continued in service for several more years. After experience with the initial Strachans bodied coaches, from 1957 Aldershot & District adopted the AH 470 engined Reliance as its standard saloon type with Weymann B41F (OMO) or B43F bodies. The initial buses had opening windscreens for the driver, but the 1960 and subsequent batches incorporated fixed windscreens which had just become legal. No.390, 390 AOU was a 2MU3RV vehicle of 1961, and representative of the final style of the Weymann A&D saloon. 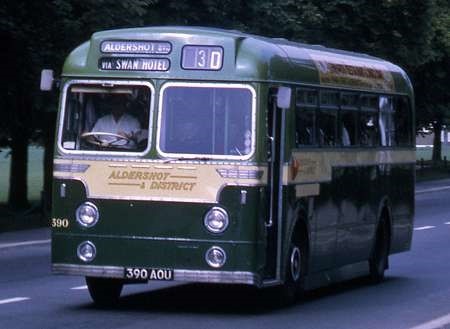 It is seen in Queens Avenue, the technically military road that links Farnborough North Camp with Aldershot, and is wearing the revised saloon livery of 1967 with the darker green on the lower panels. It is also carrying the retrograde ‘simplified’ fleetname style that appeared in that same year. The Metro-Cammell bodies on MOR 581 above and some new 1966/67 Reliances differed from the Weymann version in several respects – the offside emergency exit was placed at the rear instead of the centre, the front screens lacked the metal surround, and the lower front panel incorporated a small grille. This was from a batch of twenty-five 250-274, MOR 581-605 new in 1954/5 with Strachans C41C bodies. In 1965 250/2/4-7/9-62/4/9/70/2/3 were delicensed and the bodies removed. The chassis were rebuilt and were rebodied with MCW B40F bodies, renumbered 543-557 respectively, and entered service in 1967. They were to the same design as 283-312, RCG 601-630, which had been new in 1957. Prior to 1966 bodies were built by Weymann at Addlestone and by Metro-Cammell in Birmingham but after the Weymann works closed at the end of 1965 all subsequent bodies were built by Metro-Cammell-Weymann. Many thanks for your further thoughts on the history of this vehicle and her sisters. I can remember seeing the AEC Reliance chassis parked in the Guildford garage all painted in bright silver paint, I assume they were waiting to be sent for rebodying. I was a passenger on an A & D Loline 111 service 20 travelling from Aldershot to Woodbridge road Guildford to attend technical college. I’ve been thinking (I do occasionally!) and I suspect that the fifteen Strachans Reliances selected for rebodying might well have been chosen on the basis of body condition, the better ones being retained as they were. Certainly those that kept their Strachans C41C bodies continued in service for several years after 1965. 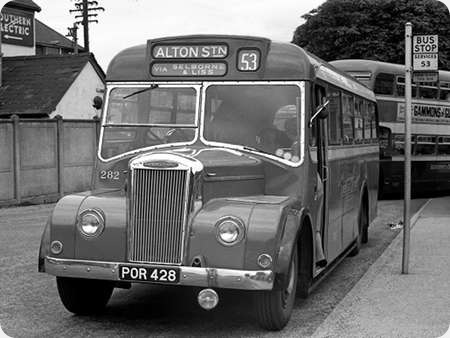 In the picture above 282 is seen in 1961 at Petersfield Station, awaiting departure on the very rural route 53 to Alton. A Dennis Loline I arriving from Guildford on route 24 pulls in behind. If I remember rightly, these buses were a ‘challenge’ to drive. The driver’s signalling window was higher than the driver’s elbow level, being closer to his shoulder level, so requiring an upward angle for his arm. I think only his hand could actually reach out, because the driver’s seat was so far inboard. And the raked steering wheel was not positioned on the centre line of the driver’s seat either. So he was always steering through a bit of an angle – a bit like riding a horse side-saddle! Obviously from an era when pride in the fleet was something to be encouraged. Today’s attitude seems to be that pride is an unnecessary outdated luxury, which is an expensive time consuming drain on recourses. Quite a few types of normal control buses seem to have had the steering column positioned further towards the centre of the vehicle than forward control machines. I have never driven a Falcon, but this was certainly true of the Bedford OB, the Leyland Comet and the Guy GS. In my experience of all these other examples, the bodywork tapered inwards towards the front of the vehicle allowing reasonable access to the signalling window. The Strachans body design on these Falcons retained parallel sides right up to the bonnet, and I can well appreciate the difficulty of actually extending one’s signalling arm to as mentioned by Petras 409. I agree also, that the signalling window was set absurdly high for practical use, the saloon window level being set at a higher level than that of the exactly contemporary GS, which was a delightful little bus to drive. Strachans didn’t take ergonomics into account when designing these Falcon bodies.